As of late, Donald Trump has been saying that the 2016 Presidential Election is rigged against him, and he is both right and wrong. In a way, yes, the election is rigged against him, but it would have been rigged against whomever the Republican nominee was. So, it’s really not about him, though like everything else, he would like it to be. This Election was going to be rigged in favor of the Democratic nominee no matter what, because just like with Barack Obama, 99% of the mainstream media is pulling for Hillary Clinton. This year, the big name networks, anchors and pundits have not even attempted to appear unbiased, and CNN especially has been a 24-7 Clinton “attack ad” against Trump. If CNN isn’t on the Clinton campaign payroll, they should be. Trump has made it so easy for them though, and has given them way too much ammunition to use against him. The sad reality is that the powers that be, in this nation and globally, have their idea of what America should be, and they won’t allow a Republican President to reverse all of the damage which Obama has done. What we Christians call damage, they call progress. I really don’t believe that Donald Trump would change things anyways. He is a liberal Democrat in Republican clothing. The simple fact is, when Christians are enemy #1 in a Christian-majority nation, it’s obvious that our votes do not and will not count. The fix is in against us, and this Election won’t change things, nor any Election in the future. This year, my eyes have really been opened as to how the political system really works, and that it is truly rigged against Christians. As I’ve written in past articles, each and every Election year the so-called “Religious Right” GOP dangles a few true Christian Conservative candidates in front of us, and then at the end of the day, they prop up a moderate RINO (Republican in name only). So, it’s not just the Democrat Party anymore that is destroying the Christian fabric of America, but the spineless Republican Party as well. The GOP is not what it used to be. Today, the establishment wants to grow a bigger tent in order to win more elections and gain more power, at the expense of their largest base, God-fearing Christians. Instead of fighting to preserve Biblical values, they are backing down in the fight against Gay Marriage, and while they talk a big game against abortion, they just keep on funding Planned Parenthood. For years I’ve been telling people to vote Republican to return our Nation to God, but I don’t believe that they will anymore. In my opinion, when Hillary Clinton is the next president (God forbid), Donald Trump won’t be to blame, but the GOP will have no one to blame but themselves for selling out their faithful base. I’ve been so disappointed with many Christian politicians this year, not only for backing Trump wholeheartedly, but for putting Party over Faith. Whether Dr. Ben Carson, or Mike Huckabee, or the popular pundits on FOX News like Sean Hannity, they have all put the Christian agenda on the backburner in order to elect Trump. They all knew that he would not fight for our values like a Ted Cruz would have, even if he did appoint “Conservative” Supreme Court justices. Still, these men all propped up Trump as the nominee. It’s been nauseating to watch. Win or lose this November, I’m sure they have all earned free lifetime memberships at Mar-A-Lago. Worse than Christian politicians selling out for Trump, has been the Christian ministers and preachers stumping for him. I greatly respect Franklin Graham, but even though he has not officially endorsed the Donald, everything he says regarding the Election implies “Vote Trump”. I’m saddened that Jerry Falwell Jr., James Dobson, Tony Perkins, and Robert Jeffress are all painting Trump as America’s hope and savior. They know better. I truly believe Christianity should be intermingled with politics, and our Faith should guide our vote, but the problem today is that Christian leaders and men of high esteem in the faith are trying to flip the script. Perkins actually said that he’s not voting for Trump due to “shared values”, but instead, for the direction in which he believes Trump will take the nation. Ben Carson said on MSNBC last week that Christians should put their Faith aside until the Election is over. Shame on you Ben! Falwell and Jeffress are preaching that “only Jesus would be a perfect candidate”, so we should just swallow the Trump pill. While they are right about our Lord, we Holy Bible-believing Christians are NOT seeking a perfect President, because we know that is impossible. We simply desire a President that shares our values, or… at least we ONCE DID. The worst thing about this Election is that the Democrats have succeeded in pitting Christians against one another. Believers who support Trump are being verbally attacked as “not Christian”, while those of us who won’t endorse Trump are being attacked viciously by believers who do. While I disagree strongly with Christian leaders stumping for Trump, I would never question their Faith. Unfortunately some have taken politics too far. This has been such an ugly political season. Many popular men and women of God are preaching to their flocks that we have to vote Trump “or else”, regardless of how horrible a choice he is for those who fear God. They are saying that this Election is solely about the Supreme Court, and not about Trump. Funny, I still see Trump’s name on the ballot, and not Supreme Court nominees. What good would Conservative Supreme Court justices do with a President who believes Gay Marriage is now the “law of the land”, who shares the same opinion as Obama and Hillary on the Transgender bathroom laws, and who believes that Planned Parenthood does wonderful things? While I do concede that Trump’s Supreme Court appointments would be far and above preferable to Hillary’s liberal justices, the sad fact is that it does not matter. Trump cannot win. Why should we God-fearing believers have to sacrifice our beliefs and values to elect someone who MIGHT fight for our beliefs and values? We should only be casting our vote for someone who undoubtedly WILL. In my opinion, Trump will not. He’s made a lot of promises to Christians, but at the end of the day, I don’t believe that he would take up our causes. Again, I reiterate though, because of the corruption of the Democrat Party and the biased liberal media, Trump will not win. So, though this Election has taken a lot out of the American people, I believe we Christians should at least walk away from this political season with our conscience and values intact. For FAR too long, Christians have allowed American culture to deteriorate, and then we look to the Republican politicians or conservative judges to fix it. They haven’t and they won’t. We must stop pretending that they will. WE Christians are meant to influence and change the culture, as the elected officials never will. No Republican or Democrat will ever be able to “make America great again” until they realize that, in order to do that, we as a nation must “make GOD GREAT in America again”. Until the nation returns humbly to HIM, and repents for the many years of backsliding, wickedness, and abominations, NOTHING in this Nation will change. We Christians must stop the bleeding ourselves, and push our God back into an American society which has forced him out. No matter what abominable laws Barack Hussein Obama, Hillary Clinton or the Supreme Court have passed or will pass, if their laws do not align with GOD’S Laws then they are NULL AND VOID. It does not matter who the next President of the United States will be, because neither will change this nation for the better. Only WE CAN. We need to change the deteriorating moral culture by speaking out against it. Even if Gay Marriage is the “law of the land”, we don’t have to accept it. Even if abortion is legal, we need to do everything we can to stop it. Even if Clinton does bring over 500% more Islamic refugees into this nation, we must stand firm and boldly in our Faith and not cower to their threats or acts of terror. No matter how much the government persecutes us, we Christians need to realize that there are more of US than them. If this is truly a Christian majority nation, then we need to start acting like it. If the government and leaders of this nation want to continue to mock, offend and test God Almighty, let THEM reap the consequences. We believers must disavow and stand against their every unGodly action. The Lord knows those who are His. 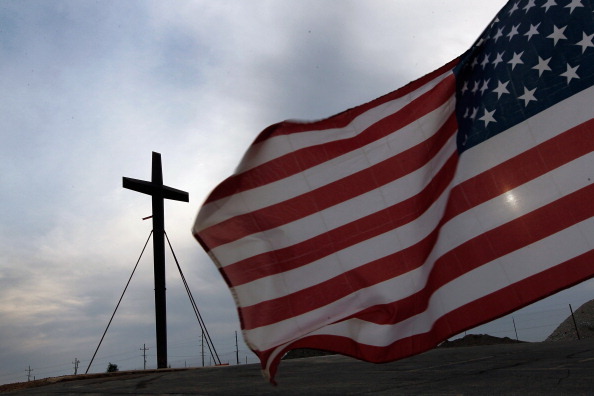 I truly believe, that more than ever in American history, it is time for Christians to take a stand. Who is the government to tell us what’s right and wrong? We have a God Who determines that. Yes they can and will threaten us, because they fear those who think for themselves and do not look to the government as “god”. But The LORD defends the faithful. Not one hair on our head will be harmed if we stand faithfully. If they do take our lives, then it is for God’s greater glory, as we join our beloved brothers and sisters throughout history who were martyred for defending the Faith. I’m sure many of you wish it won’t have to come to that, but we have to be prepared for anything in these Last Days. If we Christians don’t start doing our job, which is being the moral compass of this nation, then martyrdom may be all but a guarantee because there won’t be enough of us left to defend eachother. So who are you going to choose this November? And I’m not talking about Donald Trump, Hillary Clinton, Republicans or Democrats. I’m talking about GOD or Government? A political platform or the Holy Bible? Who or what is PRESIDENT of your life? Under a Hillary Clinton presidency, like under Obama, things look extremely bad for Christians. Are we going to be resigned to that scenario, or are we going to say – to hell with Washington D.C. and the White House!? Again friends, there are far more Christians than there are politicians. It’s about time we start acting like it! It doesn’t matter what Obama says, it doesn’t matter what Hillary says, it only matters what GOD says! This November, I’m not going to rally Christians to the voter booths, I’m going to rally Christians to the Word of God. Forget this horrible election, as it is already rigged against us. We cannot win politically. We CAN win with God though. He is our only hope for a brighter future in America. Without Him, we are nothing, the nation is nothing and will be NOTHING. So instead of trying to convince all of your friends this Election to vote for Trump, Hillary, Johnson, Mcmullin or the rest, why don’t you try to lead them to JESUS CHRIST instead?! He is the ONLY Leader in history that keeps EVERY promise, has all of our best interests in mind, and is the best Defender, Protector, Healer, and SAVIOUR the world has ever known. How could anyone not vote for HIM? What we are seeing play out in front of our own eyes is following to the letter the script written about the end of days. We should rejoice. Let us spend what time is left adding to the kingdom. We can no longer hide our candle under a basket. Let it shine, Let it shine. Let it shine !!! !